Burial: Greenbay Cemetery, Van Wert, Iowa? Our Great-Grandad Bartlett Yancy Walker homesteaded a mile East of Van Wert. There are no buildings there now. He went by his initials, "B.Y.". His son Cyrus Walker was our dad's father. Cruiso Walker is buried in Leon cemetery - no family that I know of. Hansford Walker went west and was never heard from again. Malinda Walker Downey was his only girl. We visited her grand daughter this summer (1983), at Hawthorne California, when Alma, Mary, Bert & I visited our sister Florence - this was the first time we ever saw her. This is a book no longer in publication. It may be found in several libraries, most likely in their reference room. The first part of his book are facts and stories, most of locations. The second are short informational biographies. Key to Abbreviations: b. born; p. parents; w. wife; c. children; o. occupation; ch. church; 1. lodges; d. died. This is clearly our "B.Y." Walker. The only name I can't identify is "Albert"? with legend of “Reference: Name-Residence-Business-Nativity-Came To State-Post Office Address:” I read this as “B.Y.” settled in “Section 7”, was born in Surry Co., NC, and moved to Iowa in 1857. His son, Cyrus, came to Iowa at the same time. Bartlett is found living near his father-in-law, Robert Maxey (see Robert’s notes). His age is 31, and he lists his occupation as “Horticultural” (? an educated farmer?) and was born in North Carolina. His wife Frances is 22, born in Virginia. Living at home are 3 children: Elizabeth age 4, Cyrus age 2, and Washington age 5 months. (My original source, Aunt Geraldine, did not name “Elizabeth” – but think her name was "Elizabeth Malinda".) Cyrus and Washington are a perfect fit to Geraldine's data.) All the children were born in Illinois. Bartlet Y Walker is living next door to his brother-in-law, Richard A Maxey. 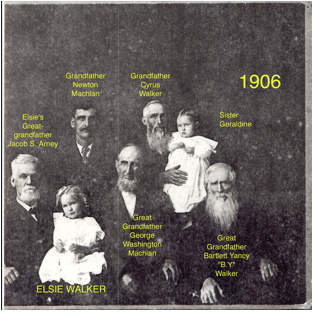 They have three boys under 10 (Cyrus, Washington Hansford, & William Cruso), one male 20-30 (probably his brother Richard, or maybe a hired hand? ), one male 30-40 (B.Y. ), one female under 10 (Elizabeth), and one female 20-30 (Frances). Two men are in the militia. They have livestock worth $315. “Find a Grave” shows daughter Frances R buried near her parents in Green Bay Cemetery, Clarke County, IA. (Photo shows marker is badly eroded, hard to make out age at death – reporter’s best guess was “3 mo 26 days”? If correct, that would have her born 15 May 1859?) The 1860 Federal Census Mortality Schedules report she died of “Inflammation of the brain” (encephalitis) after an illness of 4 months. Bartlett Y. is age 40, a farmer, with real estate worth $3600 and other personal estate worth $600. He was born in North Carolina. Wife Frances is age 36, born in Virginia. At home are Elizabeth age 15, Cyrus age 14, Washington age 10, William C. age 7, and Claiborn A. age 4. Also in the household is Bartlett's brother, Richard B. Walker, age 31, occupation house joiner, born in North Carolina. And they have a farm laborer, Joseph Ray, age 20, born in Illinois. Although he got indexed as “Bartletz”, the census taker meant “Bartlet Y”. He is age 50, a farmer, with real estate worth $7750 and other property worth $1916, born in North Carolina. His wife Frances is age 38 (obviously she ages slowly!) born in Virginia. Children are Cyras (age 22, worth $325), Washington (20), William C. (18), and Claborn A. (15). All the boys are listed as Farm Laborers, but the youngest two have been attending school as well. Bartlet (sic) Y Walker, age 60. Farmer, was born in NC. His father was born in NC, and his mother in Virginia. His wife Frances is age 52, and she and her parents were all born in Virginia. Their farm is adjacent to that of his son Claborn and wife Mary. They also live near Robert Maxey, who is probably related to Bartlett’s wife Frances (Maxey). B. Y. and Francis are living next door to son Cyrus. B. Y. Walker is found along with his second wife M (Melissa). He was born October 1819, is age 80. He and his parents were born in NC. He can read, write, and speak English. He owns his property, has no mortgage, and it is a farm. His (second) wife was born April 1836, she has had 3 children and they are still living. She was born in Ohio. B. Y. and Melissa are present (no additional info). This was a revelation, never knew he had been in Idaho! Bartlett Y. Walker is age 90, has been married twice, and is living with his son Cyrus and Cyrus' second wife Adelia. See notes with Cyrus. NOTE: His second wife, Melissa Walker, age 75, is living with HER son, Walter Bassett, in Somerset, Mercer, MO. Certificate Number is 001740. He was born 10/31/1819 and died 3/19/1912 in the City of Weiser, County of Washington, Idaho. B. Y. Walker and wife Frances are buried in Green Bay Cemetery, Clarke County, Iowa. Marker photo online. “Frances R Daughter B.Y. & F Walker” is buried in same cemetery. “Mrs Malissa Walker 76 years of age and mother of Walter Bassett, a prominent farmer of Somersett township decided late last Sunday evening at the son's home four miles north of Ravanna, by jumping into a cistern. From the meager details of the grewsome tragedy obtainable by telephone we learn that Mrs Walker had appeared in her usual health that day, coming down to breakfast in apparently good spirits. She refused however to eat any dinner and remained in her room all afternoon. About five o'clock neighbors came to the Bassett home and called the family's attention to the fact that the trap door to their cistern was standing open. About the same time it was discovered that Mrs Walker had disappeared. Rushing to the well the family were horror striken to see the hair of the aged lady floating about on the water, which it later developed was just deep enough to reach the woman's forehead. Living males are most likely to be found descending from B. Y. Walker, born in 1819. Following is a partial descent, with the male "ends of the Walker line" marked in red. I will comment on each of those shortly. Those who are promising for further research are "Bold Red Underscored". Virgil E. WALKER (6 Jun 1875 - ) & Emma. Virgil is a definite dead end. In 1900 he was a student in Des Moines, Family reports (Marilyn Shamp) are that he taught school in Iowa and married "Emma". He and Emma are then found in the 1910, 1920 and 1930 census in Rochester, New York. And no census indicates there are any children. Roscoe died as an infant. Virgil's only child was a daughter, Karen. These two sons are found in the records for the Van Wert Cemetery, they died in 1882. Now we come to a very promising candidate for a person who might have living male descendents. He first appears in the 1920 census for University Place, Lancaster Co., Nebraska at age 5. In the 1930 census he is age 15, and in Omaha, Nebraska. No census after 1930 is available, and the only further records are the California Death Index and the Social Security Death Index (SSDI). These show he died 5 Feb 1986 in Castro Valley, Alamedia Co., California 94546. With no records yet found between 1930 and 1986, there is every possibility he has a family, perhaps with sons. This candidate is as promising as his brother, Leo, above. And there is evidence that they lived very close to each other at their death, in adjacent California counties. Harold is found in the 1920 census in Nebraska at age 3. In 1930 he is in Omaha, age 14. The California Death Index says he died 4 May 1992 in San Joaquin County, California. We're missing 62 years of his life, certainly leaving room for a family. While I haven't yet found info on the death of Kenneth Walker, he also remains a promising candidate for "surviving family". In the 1920 census for Nebraska he is 10 months old, so he was born in1919. In the 1930 census for Omaha, Nebraska, he is age 11. I have found very little on "Ulisses" (probably actually "Ulysses"?) who was age 7 in the 1930 census for Omaha. But he is certainly a candidate. Charles William Walker appears to have had only daughters; Bertie, Ida and Wilma. This child is found as a member of the right family only in the 1885 Iowa Census. There is, however, a Roland O. Walker of exactly the right age found in the 1900, 1910, 1920, and 1930 census - - in the "Iowa Institution for Feeble Minded Children" in Glenwood, Mills County, Iowa. It would appear that he was born permanently handicapped, and that his family was unable to care for him. This also is a promising candidate. He is first found in the 1920 census for Kansas City Ward 3, Wyandotte County, Kansas at age 2. He is still at the same location in 1930, at age 12. The SSDI shows he was issued a Social Security # in Kansas before 1951, and that he died 12 May 1989 in Blue Springs, Jackson County, Missouri 64015. Again, nearly 60 years of his life are presently missing records, but there is every possibility he had a family. (I called every male "Walker" in Blue Springs, but none would admit to knowing Bart.). SUCCESS: Found a son of Bartlett O. Walker who agreed to the DNA test! This was a match to the expected group, confirming our descent from Robert Walker Esquire! Claborn had only the two daughters, Lena and Gertie.